Southern Italy’s strawberries are particular is growing. According to estimates edited by CSO fruit centre, in Basilicata strawberry cultivation has grown by 17% over last year, and in Campania too it is reinforcing with +5%. Strawberry surfaces have increased in Sicily too, while in Calabria they are stable. In Northern Italy the importance of the Veneto region for strawberries is confirmed, especially the Verona area. 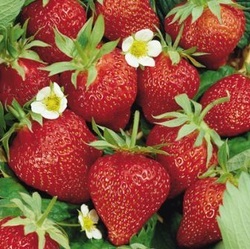 In theprovince of Trento too strawberry surfaces have grown in 2012, while in the Bolzano area they result to be stable. Also the Emilia Romagna region is quite important for strawberry cultivation, though surfaces are relatively stable. 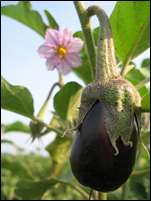 Considering varieties, in Veneto “Eve” is progressively growing, followed by “Alba”. In Emilia Romagna the most cultivated variety is “Alba”, with 48% of the plants, followed by “Thecla” at very long distance. In Southern Italy the varietal situation has proved a certain dynamism in recent years, particularly in Campania that has passed from the Camarosa variety, that only 4 or 5 years ago accounted for 70% of the total, to the Candonga to today's boom of the Sabrina, with 28% of the total, and Amiga, with 18%. In Basilicata the Candonga prevails with 85% of total surfaces, while in Calabria the main cultivars is Camarosa followed by Rania. The wide range of varieties, a rational distribution of production schedule and very high quality levels make the Italian offer today's increasingly competitive and qualified. Pork dominates throughout the Calabrian cuisine. Around the pork and its slaughter has developed over the centuries a great tradition of folk rituals, legends and customs. From the art of slaughter derive the cured meats of the region: the famous SOPPRESSATA, consisting of lean meat from selected pieces of thigh and threaded and seasoned with pepper and salt, sweet and spicy sausages, smoked pancetta, capicollo, ‘nduja oil production oil from Calabria stands for its ancient tradition. Typical aromatic oils, obtained by macerating in extra virgin olive oil spices, dried in the sun, are a real treat. The tastes of pepper, rosemary, lemon, oregano, basil, flavored with their special flavor the dishes of food, simple but very tasty. The silane cheese The cheese is a semi-hard cheese whose flavor changes with increasing the curing time, going from sweet to spicy. The craft technique used traditionally passed down to today, was very sophisticated because the cheese had to be preserved for a longer time, as constituted, together with the processing of pork products, the supply of food throughout the year. The ‘nduja The nduja if a meat soft, spreadable, spicy culinary tradition that is part of Calabria. It is produced in a precise and narrowly defined geographic area of Calabria Catanzaro area. 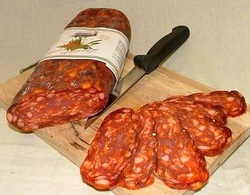 The 'nduja has a reputation as an aphrodisiac that helps the heart, acts as a vasodilator with great benefits for the coronary arteries and capillaries. It can be enjoyed as a spread on bread or with pasta. Lo Stocco Mammola The cod fished in Northern Europe is carefully selected. The largest codfish, after being cleaned are salted and dried cod will become. Those of medium size, are best hung on the scaffolding of wood dried in the sun and the cold Arctic air clean, and become Stockfish or stockfish, which in southern Italy is commonly called "STOCCO”. At the end of this process of natural conservation, the fish is imported into Italy to be transformed into food of great value, produced by hard and dry edible food you must Exclusively handmade, consisting in cleaning and put to soak in next steps and for several days in running water of good quality. It 'obvious that water is of particular importance for the success of the final product. The waters can see from the numerous mountain springs Apennine Mammola have a particular chemical and physical composition, rich in trace substances, which combine with each other, resulting in a perfect ripeness of Stocco soaks, enhancing its quality, and thus obtaining a white product, roughly and very tasty. And 'this, the main reason, along with the professionalism of those who work, for centuries, which determines the production of fine Stocco. Over time, the kitchen, combined with the Mediterranean diet ingredients and prepared in the old way, has become the typical dish of Mammoth and the most important of Calabria. The fish has a high food value, if you think that a pound of Stocco is, in fact, almost five pounds of fresh cod. Salt the fresh cut eggplant and let it set for around 1 hour. lay them out on a towel to dry. Lay the eggplant out on a plate and drizzle the oil mixture on top.